I have come to the conclusion, one either loves bananas or hates bananas, at least in my family. There are those like hubby who eats bananas daily and then there are my daughters who make the most unsophisticated sounds, if they hear the word banana. Shame on you girls. I like bananas in a fruit salad or in a loaf with chocolate chips. I don't enjoy a plain banana. Actually, I grew up on bananas and sour cream. Yummy. When there are always bananas in the house, one is apt to find some really ripe ones, somewhere. I say this because this was the Case of the Missing Bananas. My husband kept insisting that there were more bananas somewhere. He was so strong about this , I suggested looking under the bed, in the attic and in the car. Ok, that is a bit extreme. In the meanwhile, I bought bananas and hubby was happy. Then one day, I heard him proudly exclaiming, "I knew, we had more bananas." Yes, he found them, in plain sight. Don't ask. In a large bowl, cream oil and sugar until light and fluffy. Stir in the bananas, milk and extract. Combine the flour, baking soda and salt; gradually add to banana mixture just until moistened. Fold in nuts. Pour into a greased 9-in. x 5-in. loaf pan. Bake at 325° for 65-75 minutes or until a toothpick inserted near the center comes out clean. Cool for 10 minutes before removing from pan to a wire rack. Yield: 1 loaf (16 slices). I doubled the recipe and made three slightly smaller loaves. Lovely loaf! I am one of those people, that eats banana but not overly crazy over it. I prefer bananas in desserts! 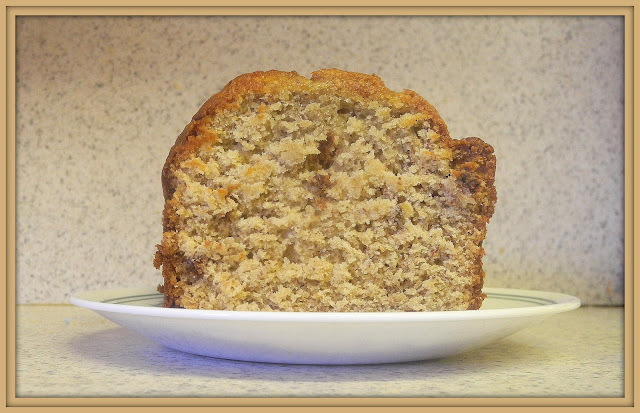 I do eat bananas but not a huge fan:D I do love baking with bananas though, makes my kitchen smells heavenly! Your loaf looks moist and lovely! My husband and son would eat banana anything. I can only eat them in something--usually something baked like this bread. You are so right that if you have bananas, you'll always find some that are overripe. I threw 3 in the freezer last night! Thanks for linking! I'm one of those "hates bananas" people, but only in the raw form! I can't even stand the smell. However, when they're in a baked good, that's a different story! Your bread looks wonderful and I would gladly take a slice. I love bananas but never made banana bread. It's not very popular here but I do want to try. The texture looks great!! Incredible. I added 1.5 tsp. baking powder and 1 extra small banana. just because I'm experimenting. Only had vanilla. Really moist. Worth the effort, takes just a few minutes.